This article is about the level in Yoshi's Woolly World. For the level in Super Mario World 2: Yoshi's Island, see King Bowser's Castle (Super Mario World 2: Yoshi's Island). For the place, see Bowser's Castle. 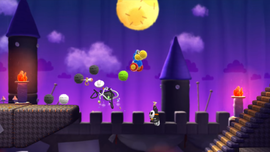 King Bowser's Castle is the eighth level of World 6 in Yoshi's Woolly World, and, by extension, the final compulsory level of the game. The level begins with Skeleton Goonies and a cannon leading to Bowser's Castle. A segment containing Fangs and Tap-Taps follows, leading to a door. This, in turn, leads to a four statues where Yoshi must find the correct color yarn for each, with the both checkpoints on either side and it has a few Hook Guys . Yoshi must first go to the left, and enter a segment with Black Shy Guys. He must then head up the stairs, past some Fly Guys (where the Moon is visible again) to an area with eight fast-moving Fly Guys. The next segment consists of more Shy Guys, as well as some Bomb Guys. The segment below it consists of water and a fast-moving yarn ball pendulum. Yoshi must hit an ! Switch at the top left of the segment and make his way to a blue warp pipe, then head left to a more secret area where he can find blue Shy Guys. Yoshi must then head back to the statues and fill them in with the appropriate colors, causing a larger statue to reveal a door. Kamek will then try to ambush Yoshi in a similar fashion to previous Yoshi levels. This leads to the boss door. Smiley Flower 1: At the bottom left of the Black Shy Guy segment, Yoshi must fill in a hidden platform outline and enter a red warp pipe. Inside the secret area, Yoshi must head right and eat a Present Box to reveal the Smiley Flower. Smiley Flower 2: Collected after falling down the pit marked with an arrow sign, just below the fast-moving Fly Guys. Smiley Flower 3: When reaching the segment with Bomb Guys, Yoshi must jump on a Shy Guy Tower to reach an alcove on the right. Inside the secret area, Yoshi will encounter two Present Boxes and one Fooly Flower. The left Present Box contains the Smiley Flower. Smiley Flower 4: In the segment immediately to the right of the statue area, Yoshi must hit the ! Switch and make his way down to the ! Block platform, then head right and jump to collect the Smiley Flower. Smiley Flower 5: In a Present Box near the final Lunge Fish. Wonder Wool 1: Unveiled after filling in a hidden platform outline just above the entrance to the Black Shy Guy segment. Wonder Wool 2: After passing the first Fly Guys, Yoshi must jump over to the left, jump onto the bead dispenser, hit a Winged Cloud above and to the right of him, follow the cloud platforms upwards, then jump to the right and bounce on three Fly Guys to get the Wonder Wool. Wonder Wool 3: Unveiled after defeating the eight fast-moving single-file Fly Guys. Wonder Wool 4: Unveiled after defeating all Shy Guys and Bomb Guys in the segment at the top right of the statue area. Wonder Wool 5: In a hidden Winged Cloud just above the only Clawdaddy. 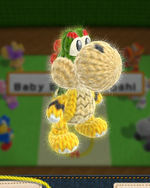 Collecting all of the Wonder Wools knits Baby Bowser Yoshi back together. Spooky Scraps! Don't Get Spooked! Naval Piranha 2: Now It's Personal! Fluffy Snow, Here We Go! This page was last edited on December 11, 2018, at 06:00.